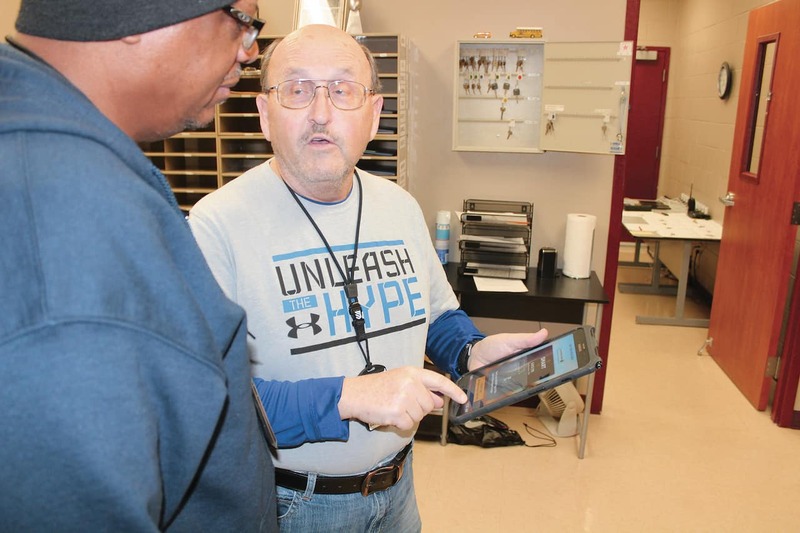 Safety Trainer Reggie Payton, left, and Dispatcher Mike Gay of Midlothian ISD in Texas, discuss student tracking and bus routes using the SMART tag system. Some children were stuck on the bus until midnight, and frantic parents were left with no way to find out where those school buses were. In response, city officials moved quickly to write and pass a new bill. In January, New York City Council members passed a new law to give parents some peace of mind regarding their child’s whereabouts and arrival times of buses. Nearly 130,000 children who are in kindergarten through fifth grade rely on one of New York City’s 9,500 school buses to get to and from school, daily. The Student Transportation Oversight Package (STOP) promises parents of these children the ability to know where the bus is via a free smartphone app. The New York City Department of Education said it plans to implement it by the start of next school year. Up until the City Council’s bill passage, only about 6,000 buses that serve students with special needs were equipped with GPS. The technology will eventually extend wide, with a bid expected to open this spring. Additionally, the New York City Department of Education will be required to send notices of late bus arrivals and departures on a daily basis. 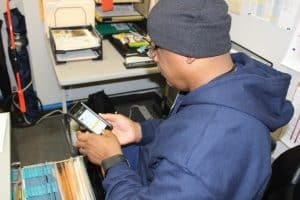 Reggie Payton checks the real-time location of Midlothian ISD’s school buses via a parent notification app. While it’s true that many forms of online technology are accused of isolating people, a good parent app can actually bridge communication gaps between bus drivers, students, parents and the school. Midlothian has 70 buses that are equipped with the SMART tag Parent Portal app, which is compatible with the Versatrans Routing System from Tyler Technologies. The district has 9,400 students in the 110-square mile area south of Dallas/Fort Worth. The Parent Portal app has increased accuracy and efficiency. At any time, Pelletier said he has information at the touch of a button, such as recently when the program told him that 143 of the 1,092 students who ride the district’s 42 buses weren’t wearing their student ID badges. The driver can manually add them or subtract students from the onboard count if they don’t use a badge. State head counts and ridership information are more accurate than relying on a driver to tally students boarding the bus. Parent Portal is a free app for parents to download. A message is sent when the bus is 10 to 15 minutes out from a stop. If there is a problem with the bus, or the driver must detour after the message is sent, a phone call is initiated. In Michigan, the integration of Zonar GPS with the SafeStop app helps hundreds of families in the Huron Valley School District stay informed about their children’s bus rides. The district already had GPS on its fleet, which covers 100 square miles of rural territory, including gravel roads. Then there are the challenging weather conditions of Michigan winters. Of the 9,000 students who are enrolled, about half are bus riders. She called SafeStop “a tremendous tool” that allows the district to send specialized messages if a bus is late, due to weather, traffic conditions or other issues. The company is also working on a “lite” version that is designed specifically for rural and underserved districts. The company announced it will be available later this year. “We wanted to provide a solution to districts that didn’t have routing software,” Mitchell added. Petrisin encouraged other districts to do their homework and make sure the systems they purchase work well together. Editor’s Note: Reprinted from the April 2019 issue of School Transportation News. Previous articleHow Do You Make a Difference?